CAMAS, Wash. - The derelict barge leaking oil in the Columbia River is already the most expensive ship cleanup project in Washington State history, and now it's getting even more expensive. The Davy Crockett is currently stuck east of Interstate 205 near the Port of Camas-Washougal. 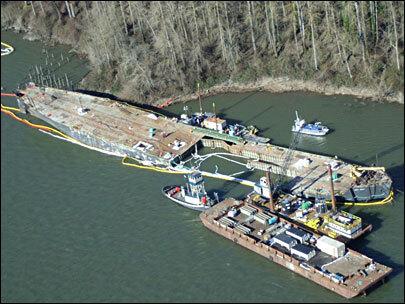 Tuesday the U.S. Coast Guard said the best way to get rid of the barge is to cut it up on site. That's a tricky proposal. First, engineers will have to build a major barrier around the vessel. "The Davy Crockett will essentially be encircled in an 850 linear foot dam which is constructed of steel sheet pilings," said Coast Guard Captain Daniel LeBlanc. It's called a "coffer dam." Steel plates will be pushed into the river bottom, keeping water out, and oil and other toxic muck in. The sheets will be vibrated into place instead of pounded down to reduce noise pollution. The involved agencies have used a coffer dam like this one in the past to remove the SS Catala from Ocean Shores, Wash. The Davy Crockett project has already cost $9.5 million. Officials said they will have a better idea of the cost of this next phase by the end of the week. "I would not say it is any more risky than getting into a dry dock," said Mike Greenburg with the Oregon Department of Environmental Quality. He said a dry dock operation would be more difficult and more expensive. The cleanup costs will be covered by the Oil Spill Liability Trust Fund, which is funded by a tax on petroleum products. The barge owner is under investigation by federal authorities.